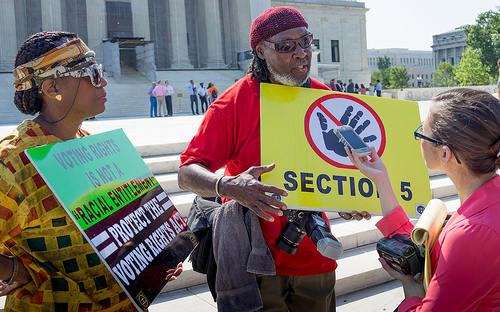 The Supreme Court has gutted the Voting Rights Act (VRA). Chief Justice Roberts displayed a chart that showed the success of the VRA and used that success to give an ill-advised reason for gutting it. One would think that the ‘Red States’ would let the dust settle before they began their re-introduction of modern day Jim Crow. Unfortunately before the ink was dry, Texas started the reinstitution of voter suppression. Texas was not alone however. North Carolina, Mississippi, & other states have joined the voter suppression movement. Does anyone believe the Right Wing Supreme Court Justices regret their vote? It is highly unlikely as they are nothing but pawns of the Plutocracy. They knew that voter suppression is the only way to maintain the status quo and the last vestige of rule by the few. Longtime Texas newspaperman John Young says it best. Watch how redistricting is done. Both parties know where the votes are. They are color-coded. And not in red and blue — try white, black and brown. Observe efforts to deprive some Americans of the vote by prohibiting bilingual ballots. Multiculturalism is a pet peeve of J.R. Crow, who won’t acknowledge that unilingual ballots would be direct descendants of Great Granddad’s literacy tests. Meanwhile, the individual costs attached to some Voter I.D. measures share the lineage of poll taxes. As Americans celebrate the 4th of July, most believe they are celebrating freedom. They believe they are celebrating a country that has grown as it delivered equal rights progressively to all. While this has been true for a long time, 30 years of financial erosion of the middle class has effectively derailed those rights. As the middle class struggles to keep their heads above water, they have little time to discern their rights that were chipped away by the Supreme Court and their politicians. The 4th of July presents a good time to discuss in a non-threatening but patriotic manner the freedoms that have been lost over these years both financially and through the ballot box with friends and strangers alike. As the parades end and the fireworks go off, just maybe a seed will be planted that forces the apathetic to engage.